For those of you who need to count calories but still enjoy the delicious delights of cream cheese, you’ll love 32% less fat Galbani Mascarpone Light®. Originating from an area South of Milan, the authentic Galbani Mascarpone® is made using a double process giving it a sweeter flavour than other brands, resulting in an unrivalled smoother and creamier taste. 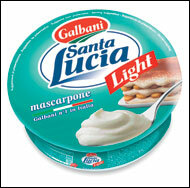 Available from Waitrose and Asda stores nationwide, Galbani Mascarpone Light® retains all the qualities of its full fat counterpart but with the added bonus of 32 percent less fat. So get cooking! Galbani Mascarpone Light® is great for both savoury and sweet dishes and ideal for stirring through sauces to thicken and add a distinct rich flavour. Best known as the essential ingredient for Tiramisu, it’s a good replacement for whipped and clotted cream as it has a similar texture. Additional recipe suggestions include serving with fresh fruit, as a key cheesecake ingredient, a cake filling or as a topping for desserts.